A caravan of about a dozen self-driving, semi-trailer trucks for the first time finished a trip across parts of Europe this week. The autonomous truck challenge was organized by the Dutch Ministry of Infrastructure and the Environment and included rigs from six manufacturers, including Volvo, Daimler and Volkswagen subsidiary Scania. The convoy journeyed from manufacturing facilities in Belgium, Denmark, Germany and Sweden to the port of Rotterdam in the Netherlands. 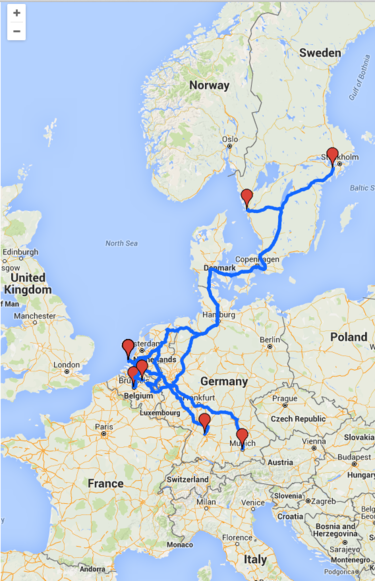 A Scania semi-trailer traveled the longest distance - more than 2,000 miles and across four national borders. The network of authorities involved in the pilot project included federal governments, roadway authorities and consumer groups from six nations. A view from a helicopter of the semi-trailer platoon driving across Europe this past week. "Over the past six months, there has been intensive and multidisciplinary cooperation/teamwork to realize this new form of mobility," the EU Truck Platooning Challenge said in a statement. "Truck platooning is a form of innovative mobility with a wide range of benefits in the areas of safety, traffic flows and efficiency. Truck platooning also reduces fuel consumption and CO2 emissions," the challenge organizers said. Platooning is a method of lining up trucks in columns where they follow each other at close distances (about 30 feet) as they drive at a constant speed. The trucks are linked via Wi-Fi, which allows them to brake faster than a human driver could. The responsiveness of each truck within the platoon is estimated at 25 times faster than the average human reaction time of one second - saving critical time in case of emergency braking. Platooning also saves gas by keeping each truck in the wind stream of the one ahead of it. Autonomous semi-trailers would also likely reduce shipping expenses by cutting labor costs since platooning trucks could drive nonstop to their destinations while human drivers would need to to stop and sleep. 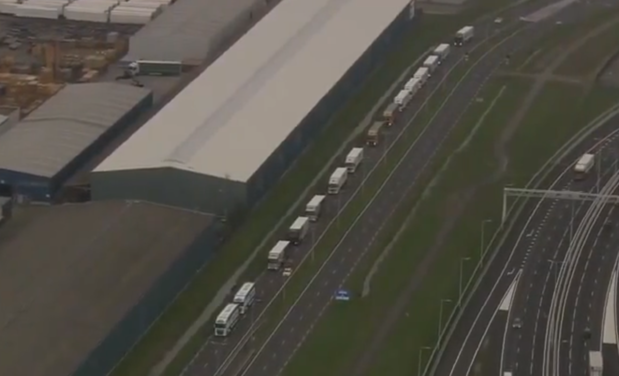 The semi-trailers left from various locations around Europe, ending their journey in the Netherlands. "There are tens of thousands of people being killed on European roads each year," said Melanie Schultz van Haegen, Dutch minister of Infrastructure and the Environment. "At present, 90% of all accidents are caused by human failure. New technologies can help mitigate the results of our shortcomings. What's more, a self-driving car will drive more economically, saving fuel, which is good for the environment and consumers. This is especially interesting for freight transportation. Tests show that trucks that drive very close to each other save between 5% and 15% on fuel." Netherlands-based NXP Semiconductors N.V. and DAF Trucks joined forces under the umbrella of the EcoTwin consortium to create the autonomous trucking technology. The technology consists of a sophisticated vehicle-to-vehicle (V2V) communications system call RoadLINK, which was developed by NXP. RoadLINK uses the wireless communications standard IEEE 802.11p combined with NXP radar technology enabling trucks in a platoon to securely exchange information in real time and automatically brake and accelerate in response to the lead truck. The high speed of communication and responsiveness of the autonomous system allowed extremely tight distances and synchronous driving between the platooning DAF Trucks, the group said. In the U.S., the first autonomous semi-trailer hit the road in Nevada for its first pilot test almost a year ago today. Daimler unveiled its 18-wheeler during a ceremony at the Hoover Dam. The Freightliner Inspiration Truck, a concept truck, underwent extensive testing, Daimler said, before the Nevada Department of Motor Vehicles granted it a license to operate on public roads in the state. This past year, the truck was driven more than 10,000 miles during a test in Germany. "I think realistically, we're four to five years out before we could see platooning on [U.S.] highways," said Darren Gosbee, director of engineering at Navistar International Corp., the oldest truck maker in the U.S. "The thing about platooning is it's like having a cell phone, it's only when everyone else has one that other trucks can enter and exit the platoon." While the autonomous semi-trailers are important pilots for the new technology, there's still a long way to go before fleets of trucks will be platooning across the U.S., Europe or other parts of the world, according to Gosbee. "As we look toward autonomous vehicles, obviously the technology has to step up. This is where we talk about redundancy and mitigation of failure," Gosbee said. "Every vehicle on a highway has some form of electronic controls, whether that's an electronic throttle or an electronic fuel control. Those have fail safes and when they do fail, they must be able to go into some fail safe condition." A "fail safe" condition would be cutting vehicle acceleration and bringing it to a controlled stop alongside the roadway, Gosbee said. Navistar International is exploring autonomous trucking, testing platooning as well as more common technology such as active cruise control, automatic breaking and lane keeping. "That's something we're very active in at the moment," Gosbee said. Another issue is that for every truck, there are six to eight trailers that don't support autonomous hookups, Gosbee said. So an aging fleet of trailers would also have to be modernized over time. There are also other complex problems to solve, such as controlling sudden movements of lead trucks. For example, imagine the lead truck in a platoon decides to swerve around an obstacle. The trailing trucks will also get the same message to swerve, but they may have obstacles around them at the time that prevent them from also swerving. "In effect, we have to think of every single use case," Gosbee said.